hey everyone, we’re going to start where we left off so in case you missed it, here’s part one, describing the story of Act 1 in detail. In this Part we’ll do an overview of the second act, and continue with this amazing story. This whole series of articles is probably going to be a weekly thing. let us know in the comments what you think about this series so far, thoughts on the band, story and music, and if you have something to add that you think that we missed your more than welcomed to share your thoughts. Sorry it took 2 weeks to post this part. Is one is also heavily based on the *prognotes summery and more places that i happened to find online without any source. I tried to make this one cover the entire second act, but it’s just not possible. there are so many great sources of information on this act and so many subtle pieces of information that will make you appreciate the lyrics, story and music much more, so bear with me. Just so you’ll know every time i write the articles i also listen to the specific album in the background to get in the mood. Well the first album kind of acted as an exposition. We got to know a few characters, got ourselves familiar with the background to our protagonist, and with his mother. The Mother, Ms. Terri was a prostitute, working in a place called The Dime in The City and manage to escape to raise her child in a safe environment, so he would become a decent, moral man as she promised to herself. The Boy, our protagonist is living in a safe world, without any significant experiences. Being raised by his mother, shielded from the crueler and less innocent parts of life, The Boy is very naive,and without any significant life experience. Though the boy is blissfully ignorant (and will reach enlightenment many times throughout the story), he still recognizes that trouble weigh heavily on his mother and that she is hiding both her and his past from him. 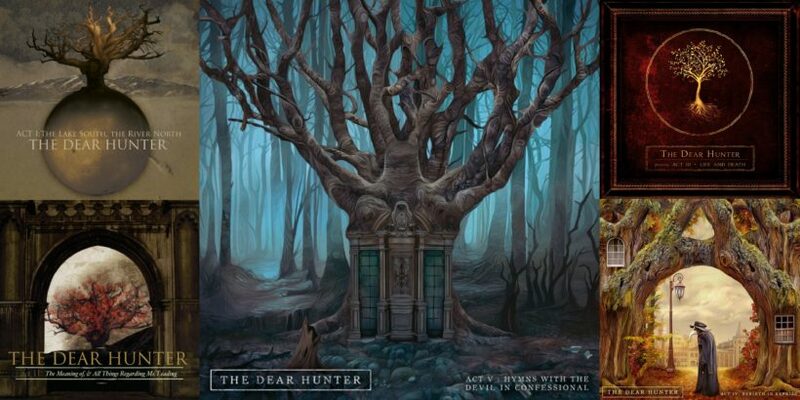 The Dear Hunter/The Boy, knows nothing about his mother’s past life but knows that there are dark secrets that she is not telling him. All the while, The Priest/The Pimp who runs both The Church and The Dime is searching for Ms. Terri to either bring her back or end her life. so let’s start discussing Act II. This album is much longer than Act I and much bolder. It is also the album where the exposition finally ends and our protagonist’s journey begins. According to Wikipedia Act II: The Meaning of, and All Things Regarding Ms. Leading was released May 22, 2007. Originally, the band had written almost 2 hours of music for the album, but managed to trim the run time down to 80 minutes so as to fit on a single compact disc. The first song is pretty much 30 seconds of silence and the orchestra preparing so we begin with the second song. when looking at the different opening songs to every Act you notice that they are really sudden. there’s no easing you in. Probably for the listener to understand that we’re starting exactly where we’re left off. So “The Death and The Berth” and “The Procession” also puts us exactly where we were when we finished Act I. The Lyrics puts us in the middle of a gruesome scene as we find a woman in the process of being murdered and letting out her final breaths of life. As was foreshadowed throughout Act I, the victim is Ms. Terri. We can only assume that The Priest/Pimp’s men have finally caught up with her, and after resisting being taken back to The Dime, they murder her instead. There aren’t many details about this. We don’t know where it’s happening and by who and the listener is left to understand on his own what’s happening. Some fans theorize that It’s actually The Boy himself who kills his mother, but it doesn’t make much sense, when the story progresses and considering the personality of the boy and the few details we know about him. (could be a hell of a twist anyway 😉 ). Nevertheless, Ms. Terri has met her fate, and the description of her demise is unsettlingly beautiful, in part by refusing to illustrate the violence itself in favor of its aftermath. “There, no one cry, Place these over her eyes, We are broke and alone.We are broken alone”- enters our protagonist, who perhaps always knew this was a possibility even though he did nothing to prevent it from happening. he also could be in complete shock of what happened, since he lived in a world where bad people don’t exist and where his mother is his whole world. Maybe He takes stock of his situation and realizes that he doesn’t have a penny to his name or anyone to look after him. He is still torn from internal conflicts, and now with this his life has been torn apart with seemingly no recourse. He buries his mother alone. He looks at the lifeless body of his mother as he buries her and thinks about how her lies and his inability to find out the truth from her has led to this. His “fatal fascination” with her life and the circumstances of her death will likely lead to no good, but he must find out the truth. There will be no literal funeral “procession” for Ms. Terri, but a metaphorical one in which her son will carry on her life and “unfinished lies” to discover the meaning behind all of it. The Boy resolves to stop acting like the broken, naive boy he’s always been, leaves the only home he’s known, armed with a vengeful decree to avenge his mother’s death and end the life of the person responsible. The song ends with the phrase “one life for another”. this has two meanings: The boy finally gets to live a full live, now that he’s mother is gone. But also, can be seen in the more biblical connotation of “An Eye For An Eye”. our protagonist is leaving the safe confines of his childhood home, realizing that there is nothing holding or binding him to there. The world is beckoning him to explore it, but the prospect is terrifying. The Boy is struggling with his innocence and naivety. Led to view life and think about things a certain way by his mother, he comes to terms with the price he’s paid for not taking responsibility for his own self at all. Now that he’s being forced into the world he will see and experience many new things, and his true self will reveal itself through the process. One more Thematic repetition we get to see in this song is the allusion to the classic Greek myth of Icarus, who attempts to leave the island of Crete on wings of feathers and wax presented to him by his father. As has been popularized throughout the ages, Icarus is told not to fly too high or too low, for the sea would dampen his feathers and the sun would melt the wax. As we all know though, in an act of hubris Icarus ignores his father’s advice and flies too high to his own demise. Here the myth is employed to represent less hubris than The Boy’s own happiness borne of ignorance. He chastises himself for having lived a happy life so devoid of knowledge about the outside world, “euphorically floating” on his own wings of naivety throughout childhood. Now that he is being forced to venture beyond his familiar surroundings he is finding himself utterly unequipped to handle any of it. His blissful ignorance has led him straight towards the sun, and the inevitable descent will be painful. The Tree appears to be a representation of the protagonist’s unidentified and absent father, if not as an actual person then as a concept of an intimidating father figure (alternatively, the tree/“the father” could also represent the concept of the unknown, which is in direct opposition to The Boy’s sheltered existence). This tree is the one that can be seen in all of the album covers. here isn’t a whole lot of clear meaning one can easily pull from both of these instances, but according to things Casey has said, this old, intimidating tree sits along The Lake and has always scared the protagonist as a boy. It appears that The Dear Hunter must pass by the tree on his way out, and finding that the terrifying grip on him lessened. The Tree symbolically shrivels up in the process. Then, we have a chorus almost identical to the one in the previous song, describing Ms. Terri’s death. Except this time it describes The Boy himself and the death of the childhood he could’ve had if she hadn’t died. When The Boy confronted his fear of the tree, he is officially letting go of his previous life and his childhood. The knife in the third line makes a reappearance from “1878” (“Fell in another hole, for the knife, for the knife”). We now learn that the knife represents happiness and the price we pay to achieve it. We make sacrifices and cut at our being to obtain it, which is what Ms. Terri had to do to raise her son to be happy. Here the knife is used to explain how counterproductive happiness is in a world that is not what it seems. our protagonist makes his way into a train. These lines are probably said by the construction workers working the railroad. The are telling us what the protagonist is experiencing, entering a world of trouble. All of the soon-to-come horrible experiences will only propel him forward and build his character as an experienced man, with a new set of values learned from experiences, and not by his mother. Destined to spend forever searching for more of what he seeks, be it knowledge, love, or “truth.” Little does he know what terrors are in store for him. The Oracles are telling the boy to throw away his old life, after living the land of the river and the lake. They’re telling him to throw away his morals, dreams, and basically anything he’s holding onto from his older life and to heed their words. This is pretty common in Greek Tragedies where “the prophets” are telling the protagonist important things about his fate and way of life, basically warning him with a cryptic message, only to be ultimately ignored. The Oracles continue to warn The Dear Hunter from his plans to uncover the nature of his mother’s death, the mystery of her life, and his father’s identity. Continuing on his current path would be disastrous. With the repetition of the chorus The Oracles continually warn our protagonist to stop what he’s doing, turn around, and avoid this entire mess. But this wouldn’t be a particularly good story if he possessed the good sense to do that, so of course we shall be moving along straight into The City, where we’re about to be formally introduced to The Priest’s place of work. “She prayed to the man with the twin in a mask”. The man with the twin in a mast is the antagonist, The Pimp And The Priest. At nights he is the owner of The Dime. The word “She” is ambiguous, but it is possible this line is referring to the character we’ll be meeting with shortly- Ms. Leading. Still, it’s pretty clear this woman is one of the Dime’s employees. It’s most likely that she first came to the man asking for spiritual guidance and wound up selling her body for profit. Echoing the refrain from “The Pimp & The Priest,” we get both the perspective of The Priest’s customers looking simultaneously for salvation and satisfaction as well as The Priest’s as he casually exclaims “Let them all fold.” This line is intended to be a rather flippant remark (one that becomes increasingly aggressive throughout the song) as The Priest wishes to allow his flock to succumb to moral decay for his own benefit. The song then further elaborates on the Priest’s way of work. Guiding men full of desire to women who will satisfy them in the basest sense but wring them dry financially and emotionally, he waits patiently for them to return to The Church to confess their many sins and soothe them. The final verse is basically saying that the hunger of those seeking spiritual fulfillment in The Church are guided to The Dime, and in the aftermath of those experiences — anger, sorrow, guilt — are twisted into creating “sin” for The Priest’s parishioners, thus always giving them a reason to return. the song ends with the words: “Welcome To The World” this is horrible and cynical thing that The Priest is doing, but the world that these albums exist in is both horrible and cynical, so you better just get used to it. At least that’s what The Priest would love to have you believe. This line is probably said in anticipation for our protagonist to enter the story, and finally start experiencing the bad aspects of the world and it’s morality. OK. i think this is a good place to stop. We will end Act II in the next post. I hope you enjoyed reading and as always-your welcome to say what you think in the comments. Thank you posting these. Looking for the next one!